Prevents the appearance of blemishes. 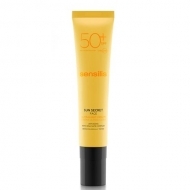 DESCRIPTION: Sun Secret Face Ultralight Cream SPF30 from Sensilis is a facial emulsion with silky texture and rapid absorption, formulated with DNA Safe Complex and UVB-UVA filters that protect from solar radiation and neutralize photoaging. With Soft Focus Effect it minimizes wrinkles and greater light. Suitable to prevent the appearance of blemishes. 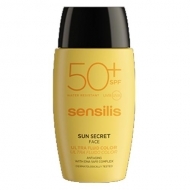 Indicated for very light phototypes and sensitive skin or light phototypes, in case of prolonged exposure. Apply about 30 minutes before sun exposure.